Mercury in Taurus: can I have a moment, please? Mercury rules the intellect and communication. The positioning of this planet tells about how you interact to people in terms of thinking and talking. Let’s find out how Mercury in Taurus is. Earth is the element of Taurus (just as Virgo and Capricorn) and Venus is its ruling planet. The element earth grants pause and stability to people and Venus makes them have a gentle aura. Going in the opposite direction of Mercury in Aries, this Mercury likes (actually needs) a moment (or should we say an eternity?) to think about things. Taking a decision will never be quick for those people. And once taken, to change their mind will take another era. They prefer to catch a thought, analyze and then speak their minds. It is not unusual that they even refuse to comment on something because they had not prepared a speech before. Calmness is their best friend in order to not act by impulse. 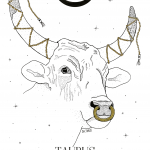 Taurus is already a sign that does not react well under pressure. So, with Mercury in this position, the person will shelter himself in a shell if forced to make a quick decision. Like their symbol bull, they need to slowly ruminate the information so they can swallow it. People who speak and stand on impulse often end up being penalized for their actions. Therefore, a little prudence is always convenient. But in trying to balance things, whoever has Mercury in Taurus should train to think more agile. Time does not wait for us and great opportunities can be lost if decisions are not made quickly in some cases. Losing the fear of the new and changing the routine can also bring us benefits. Face this as an exercise for the brain. All this slowness becomes paradoxical for Mercury in Taurus. Because Taurus is a sign that prizes much for practicality, which can even be regarded as a synonym for agility. But what these people do not have in agility, they give themselves up to everything that is practical and can be applied in life. They like to analyze the theory a lot, but it is imperative that they take it into the world of action sooner or later. These characteristics make people with excellent lore for business. Cautious and who are groping quietly in pursuit of the goal. In addition to this prudence, they also tend to be good at mathematics and everything that has a complex structure. They could be great engineers, for example. Long projects with papers that may seem shockingly monotonous to other people will also be seen as an amusement park by Mercury in Taurus. Their ability to concentrate is enviable. It is not everyone who can ignore distractions that only delay the escalation to success. Now one thing that can ruin the reputation of Mercury in Taurus in the professional field is the attachment that the rigidity of the earth element brings. They can become so blind and reluctant to change their minds that they can get into fights for being the owners of truth. Stubbornness will make them act like mules (or rather bulls) that will cost them friendships.